Perform Finger Flips, Ollies & Other Fun Tricks! Perform finger flips and cool tricks! 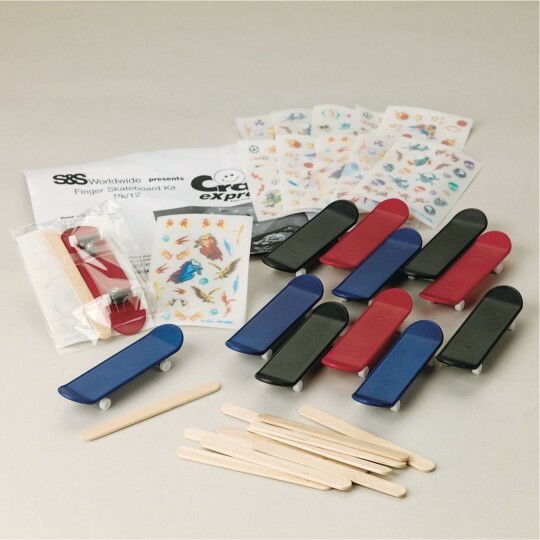 Jump on "board" with this fun craft kit! Includes 12 rub-on transfers and craft stick. Plus plastic 3-1/2"L x 1"W skateboards with moving wheels. Perform finger flips, ollies and other fun tricks with your own mini skateboard! 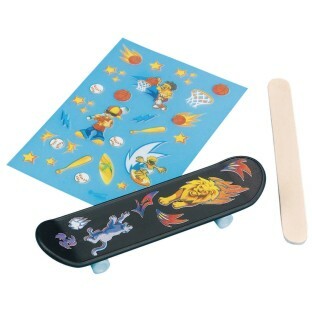 Includes 12 rub-on transfers, craft sticks and plastic 3-1/2"L x 1"W skateboards with moving wheels. Among the designs included are sports, animals and skulls. My Campers Loved the Mini Skateboards! Perfect craft for young boys! I had a difficult time finding crafts for my classes meant for boy campers. This project was easily done in the 30 minute class and the kids enjoyed playing with them afterwards.